On May 24, the House Subcommittee on Commerce, Manufacturing, & Trade held a legislative hearing on 17 bills proposed to modernize, provide transparency to, and improve the Federal Trade Commission. One of these was the Stop Online Booking Scams (SOBS) Act, a bill that would place new onerous requirements on perfectly reputable and trusted online travel companies without any justification for doing so. Various stories of customer service-related matters offered exclusively by the hotel industry have led to the drafting of legislation that provides no consumer benefit and only serves to undermine the reputation and record of the independent distribution of travel. 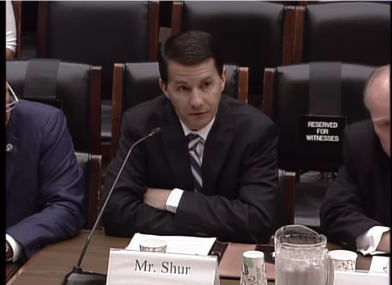 Travel Tech President Steve Shur testified in opposition. As Shur pointed out in his testimony, online travel companies have created, in just two decades, an entire marketplace where consumers can shop, compare, and book hotels, flights, car rentals, and countless other travel-related activities across hundreds of brands all in one place. It is also clear that the American public not only relies on the convenience of shopping across multiple travel brands on our websites, but they continue to trust online travel companies with their vacation and business travel itineraries. The SOBS Act is nothing more than an attempt by some to dismantle the transparency that our industry provides for the consumer in a marketplace where hotels compete with one another on location, price, and amenities. Any government action in this regard should be predicated on a tangible record of consumer harm – something FTC Chairwoman Ramirez admitted during the hearing that her agency did not have and that the hotel industry cannot provide. Indeed, the largest travel consumer advocacy group, Travelers United, sent a letter to members of the subcommittee confirming that no such activity has been recorded or tracked. Consumers know that online travel companies are safe, effective, and transparent, and Travel Tech will continue to oppose legislation that seeks to confuse or scare consumers away from this vibrant marketplace. This month, Travel Tech’s Matt Kiessling joined a panel on short-term rental regulation held at the National Association of Realtors’ annual Legislative Meeting and Trade Expo in Washington, DC. In addition to Kiessling, Brian Blaesser of the law firm of Robinson and Cole, as well as Craig Kalkut from the American Hotel and Lodging Association appeared on the panel. The group fielded questions from the panel’s moderators on a variety of topics ranging from health and safety concerns to tax issues, and ultimately property rights. At the heart of the discussion was the role that states and municipalities must play in balancing the rights of property owners with the need to ensure a basic regulatory framework exists for operators, hosts, travelers and communities. Kiessling stressed the need to ensure that states and municipalities recognize the rights of individuals to rent their homes, either as short-term rentals or through a long-term lease, emphasizing the fact that the duration of the rental should have no impact on the zoning of a property. Blaesser concurred, adding that fundamental property rights allow owners to buy, sell, or rent their home, and that to remove or limit any of those three core tenants would be a dangerous affront to homeowners. As short-term rentals grow in popularity, states and municipalities have struggled to meet the regulatory challenges associated with traveler demand. In seeking to address those challenges, it is essential that municipalities start by acknowledging short-term rentals are a residential use. Many in the audience felt strongly that the property rights argument needs to be reiterated, as policymakers around the country continue to cross the line when it comes to short-term rental regulation. It is critical that state and local governments get short-term rental regulation right; Travel Tech will continue to advocate for broad regulatory frameworks that protect the property rights and income opportunities of hosts and meet the demands of travelers. Global distribution systems (GDSs) and the companies who run them are engines for competition. These travel technology solutions providers have had a profound impact on the airline, hotel, car rental, and other travel related industries, whether through the GDS itself or through the cutting edge IT solutions they provide. Gone are the days where consumers or travel agents call up an airline to book a flight. 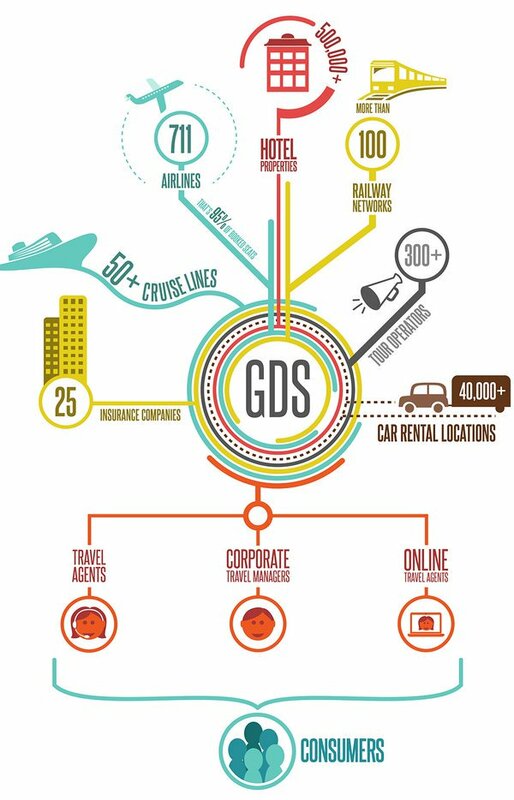 Instead, GDSs connect corporate and managed travel representatives, travel agents, online travel agent and meta search sites, and regular consumers alike with travel suppliers. Agents and consumers can then search, compare and book travel on a single platform across a wide range of variables – price, schedule, amenities, convenience. Of the $10 billion Americans spend each year on business travel and family vacations, more and more – about 50% - of these transactions are occurring through independent distribution channels. Consumers and travel agents find that, as a result of the capabilities of the GDS, they can access all the information they need to consider every option. This kind of transparency encourages competition. The ability to shop across brands – whether for airfare or for hotels – allows customers and travel agents to perfectly tailor a trip to their budget and preferences. Competition of this sort drives down prices, and should encourage businesses to do better, cut costs and improve service. Unfortunately, airlines and hotels seem to be responding to increased competition by digging in rather than innovating and improving. Whether through book direct campaigns that allow access to certain prices or ancillaries only through a brand website, by advocating against additional competition, or selectively choosing who can access fare and schedule information, the airline and hotel industries are doing whatever they can to keep customers from seeing the full picture and being able to comparison shop. Travel Tech’s innovative members take a more optimistic approach to the travel economy, believing that access to all travel options will mean more people will travel more often. Our technology providers work to maximize and expand the overall travel ecosystem rather than hunker down in a protectionist position. Fostering an open, competitive market broadens the scope of the travel industry, increases its economic impact, and provides real benefit to consumers. Policymakers on the Hill and in the Administration need to acknowledge the value of competition to the overall economy and the traveling public and establish policies with that in mind. It’s a rare and impressive sight when government chooses to be forward looking and create policies that keep economic growth and marketplace realities in mind. It’s certainly not easy for lawmakers to tell legacy industries that they are going to pass laws that acknowledge and embrace a new economy. 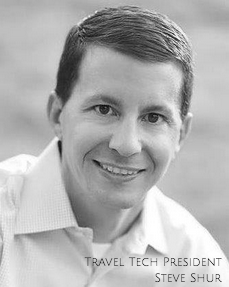 The ride sharing industry is a prime example of this policy evolution. Much to the objection of the traditional taxi industry, cities and states have forged a path that allows ride sharing platforms to operate, meet travelers needs and offer America’s newest entrepreneurs the opportunity to earn additional income. Kudos to Arizona’s lawmakers and Governor Ducey for similarly getting it right on homesharing. Arizona realized that demand for short-term rentals among travelers is on the rise. By affording individual property owners the ability to rent out their homes to travelers, the state created an attractive and effective means for them to earn additional income while preserving and protecting their real estate investments. Lawmakers recognized that by opening Arizona’s doors to the 21st century traveler, the state’s travel and tourism economy will thrive and grow. Governor Ducey led from the front, acknowledging that an honest and collaborative dialogue with industry, based on facts and not hyperbole offered by the incumbents, leads to good outcomes. Other states, take notice. In SB 1350, Arizona created and adopted a statewide standard for the short-term rental economy. A broad framework brings a level of certainty whereby the state can avoid a patchwork of municipal laws, assure consistency in the application of the law, and secure uniform tax collection for the state and municipalities. Perhaps most importantly, SB 1350 preserves municipalities’ ability to continue to enforce local ordinances on parking, noise, trash collection and other neighborhood issues. States and cities that have tried to limit, restrict or otherwise ban the ability of homeowners to rent out their homes have only found that the activity continues in an unregulated, untaxed environment. Clearly, under Governor Ducey’s leadership, Arizona recognized the value of a more positive approach to the future and chose not cave to the threats, mischaracterizations and fear mongering put forth by the incumbent accommodations industry. Hotels reported the highest occupancy rates in history in 2015. Short term rentals have seen their own rapid growth. More people are traveling and traveling more often. The entire travel and tourism ecosystem is benefitting from the new economy. Arizona got it right. For more information on Governor Ducey’s approach to the sharing economy, click here. Travel Tech members are the world’s leading innovators in travel – working diligently to improve the independent distribution of travel services through new efficiencies, creative technologies, software solutions, mobile applications, platforms and more. Their efforts have transformed the travel ecosystem, creating connections to the modern consumer that radically change the way travel operates. Skyscanner’s latest feature is a perfect example of the value these companies bring to the travel marketplace. Their just-launched Facebook Messenger bot allows people to shop for travel conversationally. Consumers can find inspiration, flight schedules, prices, and more all through a casual interaction on the Facebook platform. Skyscanner and their fellow online travel companies make planning and booking travel more accessible. Creative solutions like the Facebook Messenger bot meet consumers where they are most often and facilitate simple, familiar marketplace interactions. Innovations like these improve travel experience and encourage more people to travel more often – growing the economic impact of the industry as whole. 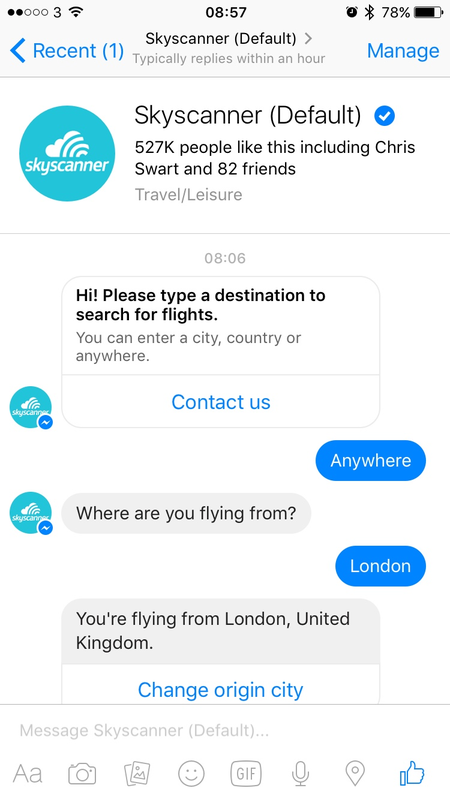 To read more about the Skyscanner Facebook Messenger bot, click here.